We've all taken a walk in nature and experienced the relaxing and often regenerating, healing impact it can have on us, right? Since I was a young girl, I've adored flowers, plants and trees. In fact, I come from a long line of 'green thumbs' on my mother's side of the family. My house is home to many house plants that decorate my living space. Funny that I never really stopped to ask why I have this deep love for the plant world. My curiosity about nature and it's healing power has increased dramatically as I've gotten older. So, when I received a random email from a fellow writer who had found my piece "Rediscovering Our Humanity Through Nature", I was sparked by what she shared. Having worked in the health and social care field, she supported patients with dementia and other long-term mental and physical conditions. How? Their holistic approach married conventional treatment with therapies that would provide relaxation to patients who often found the world around them confusing. When she said that nature played a big part, I wanted to know more. In their work, they'd discovered that patients benefitted from looking at nature, or even simply studying scenes from the natural world. Having personally experienced this, I was off to find out more! Having just read "Brilliant Green", by Stefano Mancuso, a leading scientist and founder of the field of plant neurobiology, I was fascinated by his findings. In the book, he presents a new paradigm for us to understand the plant world. Mancuso, combining a historical perspective with the latest in plant science, argues that, due to cultural prejudices and human arrogance, we humans continue to underestimate plants. Isn't that just like us humans? He found that plants process information, sleep, remember, and signal to one another -- showing that, far from passive machines, plants are intelligent and aware. Would you be surprised to hear that plants may even have 21 senses, while we humans have only 5? I'd also just read an article about how urban trees are not getting enough sleep due to street lights. Peter Wohlleben, author of "The Hidden Life of Trees" reported that "They (trees) also have to sleep at night. Research shows that trees near street lights die earlier. Like burning a lamp in your bedroom at night, it is not good for you." How many of us even stop to think about that as we walk by a tree in our own neighbourhood? Have you heard the term 'biomass' before? I had, but wasn't sure exactly what it meant. As it turns out, the bodies of most plants and animals consist primarily of organic compounds and water with the entirety of this mass called biomass. The term refers to the mass of all the living creatures in the world, plus the mass of anything that has died but not yet decomposed, such as the leaf litter on a forest floor, or dead tree trunks. Consider this. The biomass on land surfaces is more than 99% plant material and less than 1% animal material. You read that right. The plant kingdom rules, while we humans are the minority on the planet. This fact was incredibly profound to me, with enormous implications if we stop to think about it. Another reason for me to have even more reverence for the plant world. Wouldn't it be wonderful if more people felt the same? In Japan, scientists found people spending time in nature — shinrin-yoku or "forest bathing" — inhale "beneficial bacteria, plant-derived essential oils and negatively-charged ions" which interact with gut bacteria to strengthen the body's immune system and improve both mental and physical health. What is it exactly? "Taking in the forest atmosphere" or "forest bathing", refers to the process of soaking up the sights, smells and sounds of a natural setting to promote physiological and psychological health. Spending time in nature has been linked to lower stress levels, improved working memory and feeling more alive. With so much research on the health benefits nature offers us humans, it still surprises me how disconnected a majority of people are from it. Well-known environmental activist David Suzuki talks about how the heart of many of our modern-day problems is the separation of humanity from the natural world and our ongoing belief that the economy is a living 'thing.' We don't have to look too far to see that dominating belief, do we? The recurring message is that man has become disconnected from the natural world and from ourselves. We've become slaves to technology and won't leave home without it, more interested in 'capturing' nature and sharing it online, than experiencing and living it in the moment. Can you relate to this? 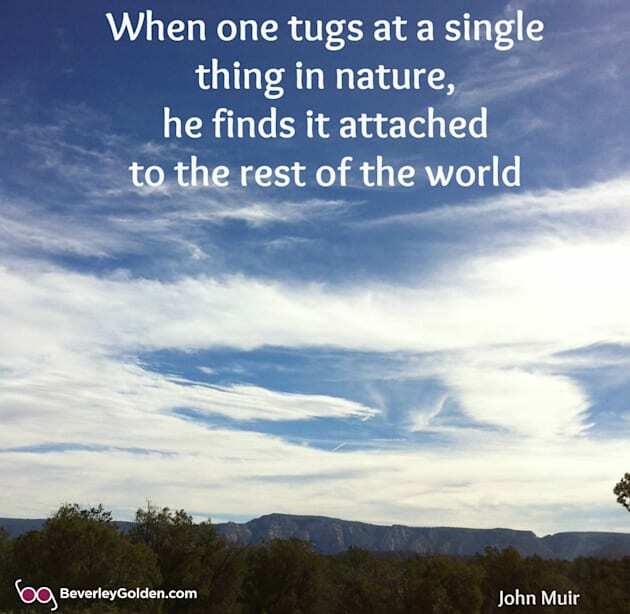 Maybe this is why on vacations we flock to the ocean, or to the mountains, to be in nature. We're moved by breathtaking sunsets or sunrises, in awe of nature's wonder. City dwellers rarely get to witness these without making a conscious effort. With the estimate that by 2050 more than 70 per cent of the world's population will be living in urban centers removed from contact with the natural world, we can see how this is increasing our disconnect from it. As a rose-coloured glasses optimist, I believe there is something we can choose to do! Maybe it sounds simple, but what if we committed to ourselves to take time each day, week or even every month, to actually get out in nature. To unplug from technology and inhale and absorb the many health benefits nature has to offer us. As a species, we would be so much better off and maybe we would collectively take saving our planet more seriously. Are you willing to make that commitment too?